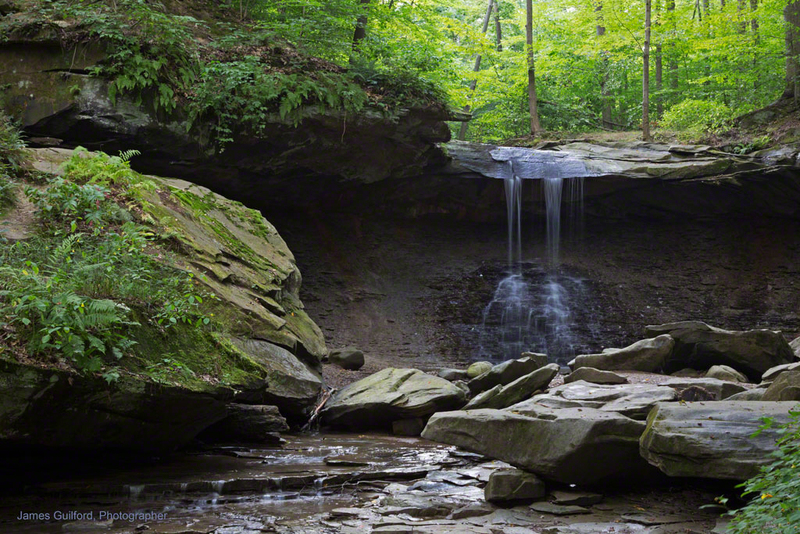 A Favorite Spot for local photographers is Blue Hen Falls in the Cuyahoga Valley National Park. I’d never been there so I checked it out Monday afternoon. I found an open parking spot in the three-car lot (more space across the road) and made the all-downhill, 1/6-mile hike to the falls observation spot. The view from the park bench was all right but, of course, I couldn’t stop there. As have many folks before me, even a few just before I arrived, I found my way down to the rocky riverbed and set up shop. With little recent rain, the falls were down to a trickle but fallen rocks, green mosses and trees, and subdued light made for a restful scene.